Sea Mist is a nice Wellcraft diesel convertible that is ready to take you to the fishing grounds or cruise the intracoastal, with her hard top and large 90 square foot cockpit, with suncover for dockside comfort. The Cats have been well maintained and rebuilt. From its large master stateroom with also a second stateroom with bunks, truly a nice set up for fishing or family weekends. A must see if your looking for something a little smaller in a convertible. 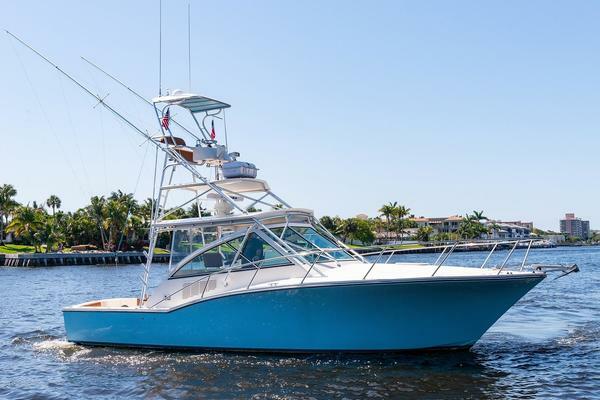 West Florida Yachts would love to guide you through a personal showing of this 37' Wellcraft 37 Cozumel Convertible 1988. This yacht for sale is located in Stuart, Florida and priced at $49,900. For a showing please contact us by filling out the form on this page and we will get back to you shortly! Master Stateroom is forward with a Queen Bed, Guest Stateroom is to starboard with over and under bunk, large salon with L-Shaped Couch and Table, Flat Panel TV, Salon Rod Storage. A lot of boat for the money, with all the equipment needed to fish or cruise.